Yves Saint Laurent is one of the most famous Parisian couture brand, recognized for its luxurious products all around the world. Thousands of items on the market bear the famous signature, from makeup and skincare to fragrance and designer clothes. The brand also produces the highly desirable YSL bags that we will talk about today. Yves Saint Laurent was founded in 1961 as the first couture house that launched the concept of luxury prêt-à-porter with. The original 1966 ‘Rive Gauche’ collection quickly became synonymous with freedom, youth and style. Thanks to the creative direction of Anthony Vaccarello – who took over the leadership in April 2016 – Yves Saint Laurent maintains its position at the summit of the luxury world. Nothing would have happened without Yves Henri Donat Mathieu-Saint-Laurent (1 August 1936-1 June 2008), the French fashion designer that revolutionized the way we look at fashion. 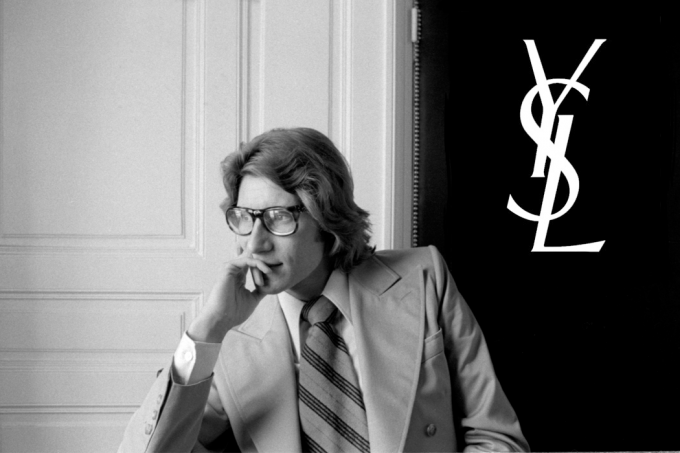 To this moment, Yves Saint Laurent is regarded as one of the greatest figures in fashion history. One of his greatest strengths was style adaptability – he was quick to accommodate the fashion changes that occurred during that period. Saint Laurent is also credited with an innovative approach to women’s fashion, creating styles that looked comfortable yet elegant. His legacy is strong still; Yves Saint Laurent created the tuxedo suit for women, dared to work with non-white models, and use non-European cultural references. Founded in 1961, Saint Laurent Paris has been – and still is – considered one of the world’s most influent fashion houses. The tuxedo jacket for women is just one of its modern and iconic pieces it launched over the years. Meanwhile, Yves Saint Laurent Beauté is now run independently by L’Oreal Paris (which licenses the name). It features a notable presence in the luxury beauty industry, upon which we will elaborate in the sections below. Success followed the Yves Saint Laurent fragrances from the beginning. Ever since « Y » was created in 1964, YSL Beauté became famous for creating “true olfactory sociological markers.” Monsieur Yves Saint Laurent’s first men’s fragrance, called Pour Homme, was launched in 1971. Today, many YSL fragrances have become must-haves both for men – La Nuit de l’Homme or L’Homme – and women – with Black Opium, Opium, Paris and Manifesto. YSL Beauté creates some of the most high-end makeup products, using the latest technology. It launches collections under the inspiration of Lloyd Simmonds, the brand’s Creative Director Makeup. Some of the makeup icons are Mascara Volume Effet Faux Cils, Touche Éclat, Rouge Pur Couture and – not to be forgotten – the Rouge Pur Couture Vernis à Lèvres glossy stain. All of these items are very popular in the countries where the brand is marketed. Trust the YSL skincare brand provides customers with the ultimate glamourous experience by using the most cutting-edge technology in the field. Forever Light Creator and Forever Youth Liberator, two of the most popular YSL skincare lines, have pushed the brand to stardom in the countries where they have been launched. Meanwhile, pioneering Top Secrets skincare presents customers with a simple beauty equation: makeup plus skincare equals a hybrid of solutions for all kinds of complexions. The Yves Saint Laurent skincare branch continues to conquer the premium skincare territory. Today, Saint Laurent Paris offers a wide range of women’s and men’s ready-to-wear products, shoes, leather goods, jewelry, and bags. In spite of the changing leaderships over the years, the Yves Saint Laurent name and iconic YSL logo is still used for handbags, shoes, cosmetics. During the time when Hedi Slimane was Creative Director (in 2015), the brand announced that the design studio would move to a new home, in Los Angeles, California, while the couture atelier will continue to operate in France. Slimane has since left Yves Saint Laurent to be replaced by Anthony Vaccarello. Let’s get to the point. Anyone who has ever owned a Saint Laurent bag knows that not only are they extremely elegant, but they also come with an irresistible cool edge. Are you looking to find your next handbag hero? 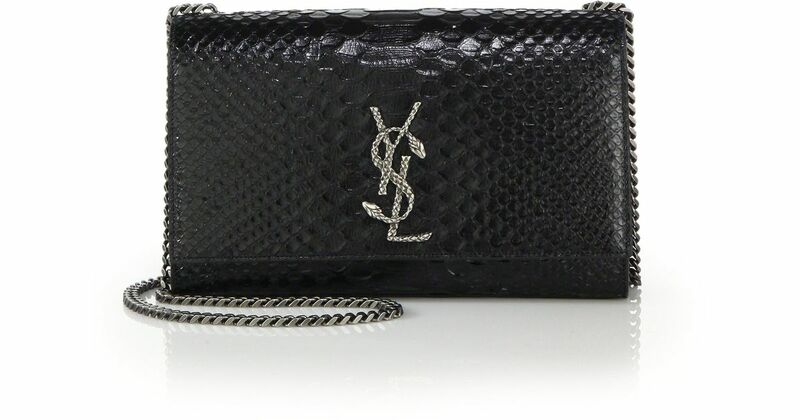 Check out our list of luxurious YSL purses, tote bags, and clutch bags. Tis the season to be jolly, and what better way to enjoy it than choosing this luxurious looking shoulder bag from Saint Laurent. Manufactured from smooth suede, the bag features a unique python-effect finish and the iconic monogram logo. One of the best designer bags released by this time-honoured design. One of top of the line YSL bags, this Saint Laurent bucket bag is a little bit on the expensive side. It features glamorous round metal studs in “Y” formation on the front and back that make it the perfect choice for any kind of event. 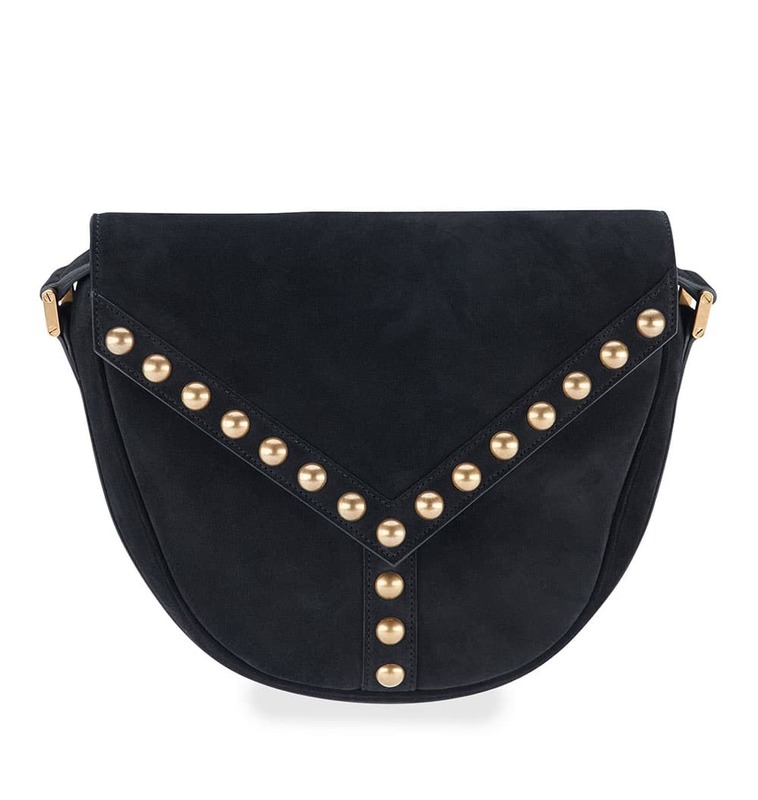 Thanks to the long metal chain strap, the suede bag can be worn either crossbody or simply on the shoulder. 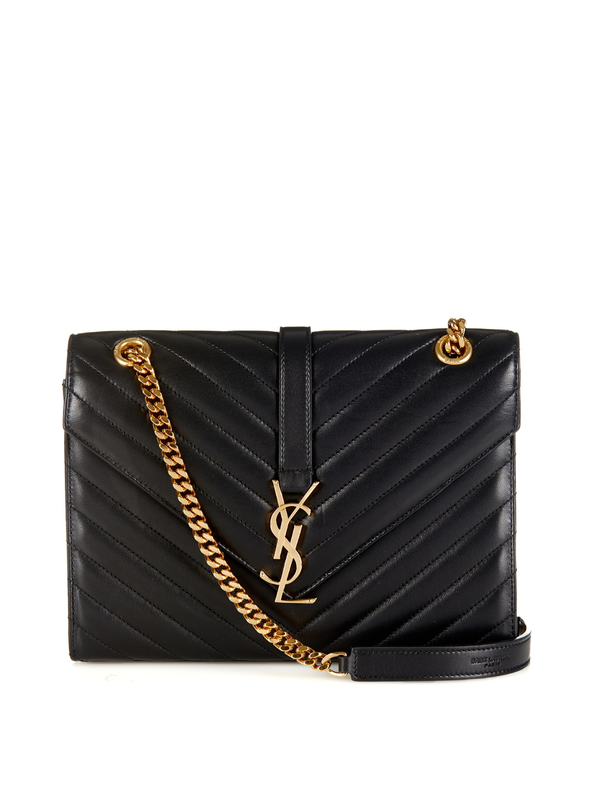 There’s just something about this YSL bag that stays with you. The nostalgic feel, the gorgeous python-embossed leather, the tassel and the beautiful plated logo are enough to make any woman swoon. The bag is a perfectly sized: Not so small that you can’t fit your personal items inside or so big that it looks ridiculous if you’re petite. The magnetic closure makes for easy access and the material is durable for years to come. It is aesthetically pleasing and perfect for going out. The pebbled-textured caviar leather of this Saint Laurent feels rather sturdy, making it ideal if you want to make a long-term investment. It’s also very easy to wipe clean should you get stains on it. Glowing reviews show that in spite of food or drink mishaps, the bag could be wiped right off. The interior of the bag comes with little details for organization; over 20 cards slots, a small zippered compartment, a larger pocket behind the back row of card slots, and another larger pocket. All of these features make it easy to fit inside everything you need without having to blindly look for the desired object later on. 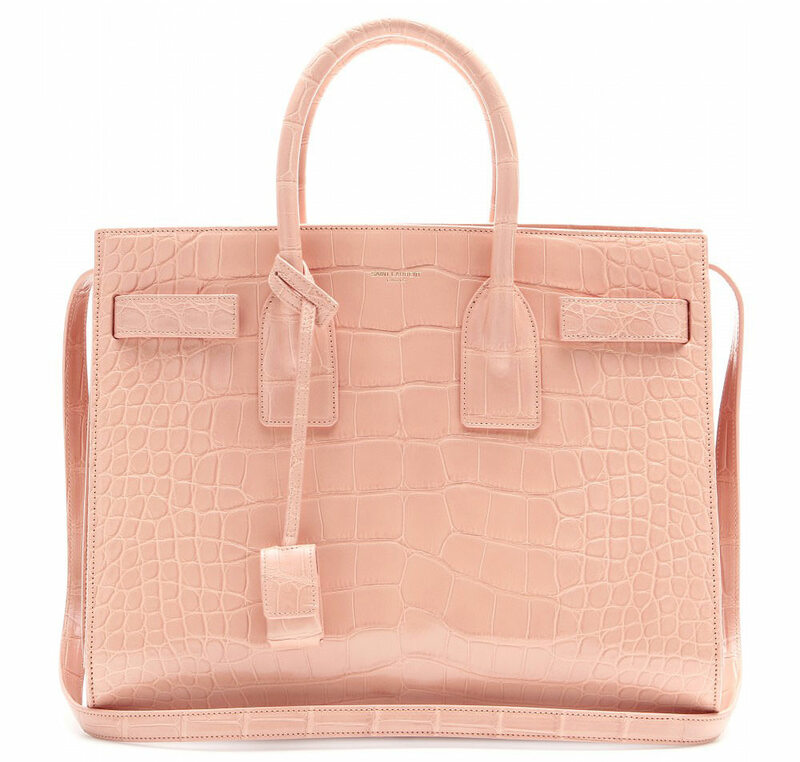 This classic and timeless Sac de Jour tote from Saint Laurent is worth your investment. One of the brand’s signature bags, this statement accessory is crafted in grained leather. It also features understated detailing and silver-toned hardware. All your essentials can easily fit in the compartments, while the double grab handles and the removable shoulder strap add to the ultimate feeling of convenience. Every YSL fan knows about the famous monogram bag. While you can also opt for the updated model (which comes with a glittered “LOVE” appliqué), the original is a classic. 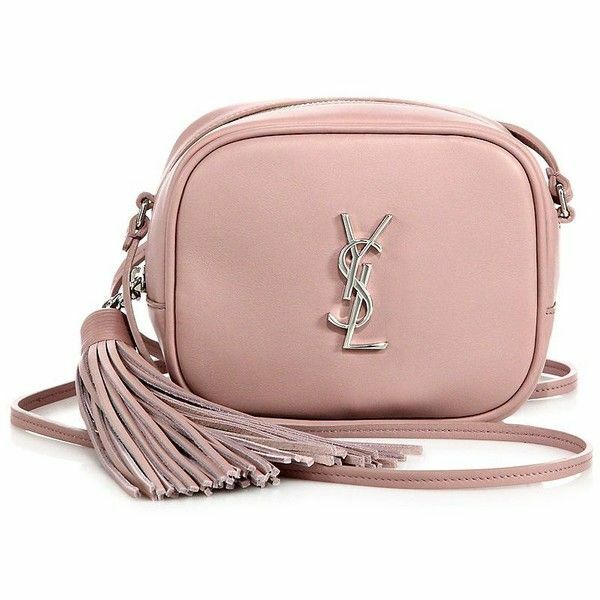 This compact style comes with a tassel-trimmed zip, as well as the brand’s signature silver ‘YSL’ plaque. The inside is spacious enough to make room for cards, a smartphone, and some makeup. It’s yet another one of the house’s signature bags; thanks to the polished ‘YSL’ embellishment, this accessory shines from every angle. The leather interior is not very spacious, which is why it’s important that the chain shoulder strap can be removed. If you don’t want to remove it each time, you can also neatly tuck it inside, converting the bag into a clutch. In spite of – or maybe because of – the expensive price tags that usually accompany the YSL bags, they will remain classics. They remind us that even though the fashion world continues to go forward, this timeless accessories will never go out style.